Krakow is ready for any trouble ‘like a bag full of anvils’ they say. 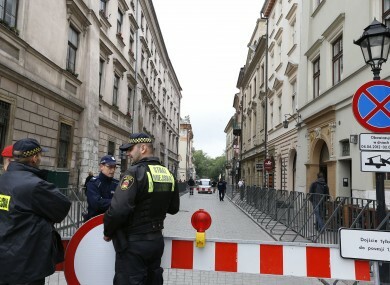 Security personnel keep guard at the entrance to the street where the England team hotel is located in Krakow. FROM TESTICLE-BITING police dogs to sonic cannons capable of inducing involuntary urination, Polish anti-hooligan squads have an array of weapons ready for potential trouble-makers at Euro 2012. The English-language Krakow Post newspaper asserted in an editorial that local law enforcement agencies were more than ready to tackle any hooligan threat at England’s southern Poland base camp. “The Polish police are going to come down on troublemakers like a bag full of anvils and you don’t want to be there when it happens,” the paper warned. ”Krakow has a long history of hooligan violence — the local police have seen it all before and they will ruin your day if you try it on. “These lads’ mums and dads rioted under Soviet machine guns — a few chairs thrown by beered-up fans is not going to intimidate them. Do not expect softly, softly police tactics. English fans are not expected to arrive in Krakow in significant numbers, with England’s Group D games all taking place in Ukraine. Email “Testicle-biting dogs 'for England hooligans', warn Polish media”. Feedback on “Testicle-biting dogs 'for England hooligans', warn Polish media”.